This dark red orange curry is made with our homemade Prik Kaeng Matsaman curry paste, giving it the delicious flavor of toasted spices, cinnamon, nutmeg, and cloves in a coconut cream gravy. 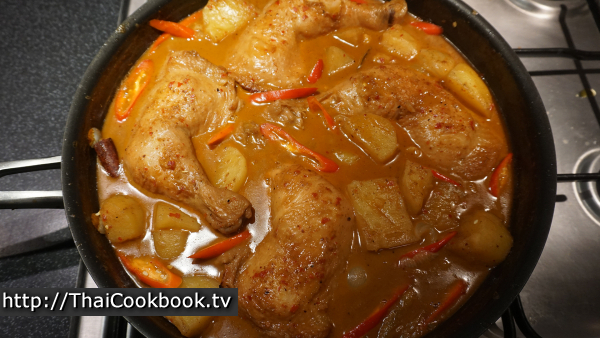 Big chunky pieces of potato surround whole chicken legs that are oven broiled, then slowly cooked in the massaman style sauce. 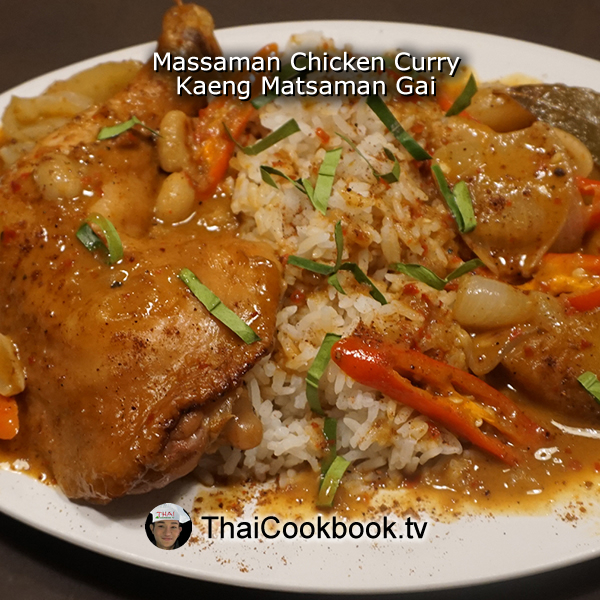 Massaman curry is made with mild red chilies, so it's not considered too spicy for most people. 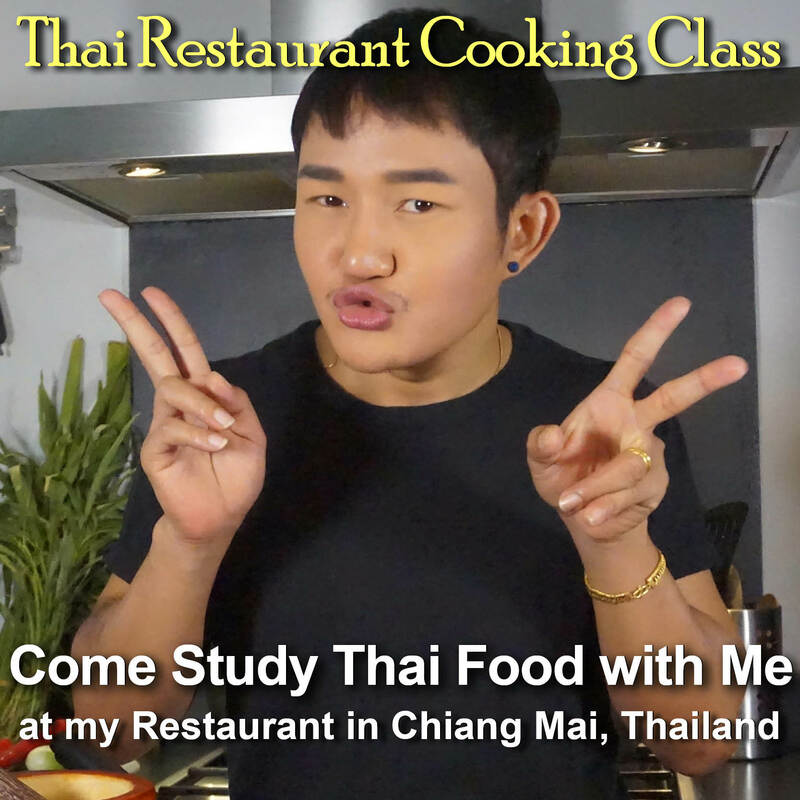 Here we serve it as a one dish meal with fluffy Thai Jasmine rice, but it can also be plated on a large platter to be served at the table with other foods. 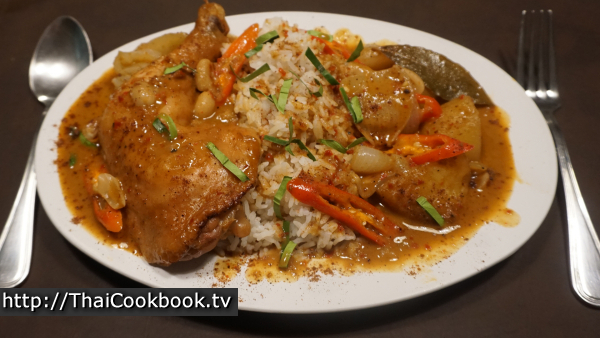 What's in our Massaman Chicken Curry. 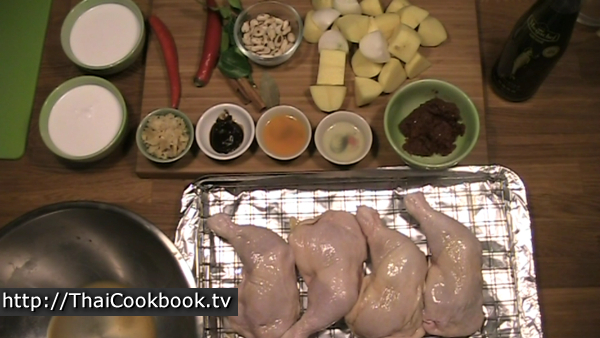 How we make our Massaman Chicken Curry. 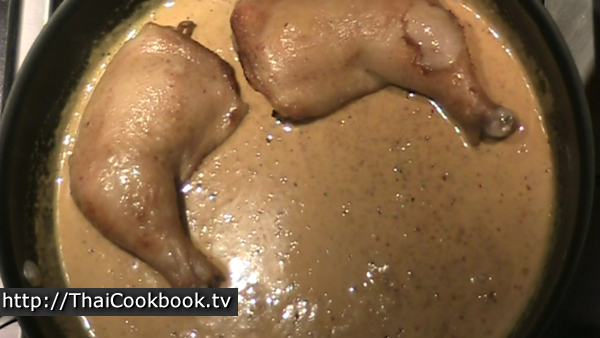 1) Marinate the chicken legs in soy sauce for 15 minutes. 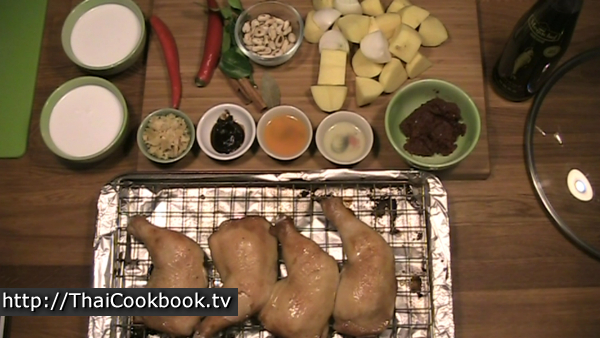 2) Broil the chicken in a hot oven until lightly browned. 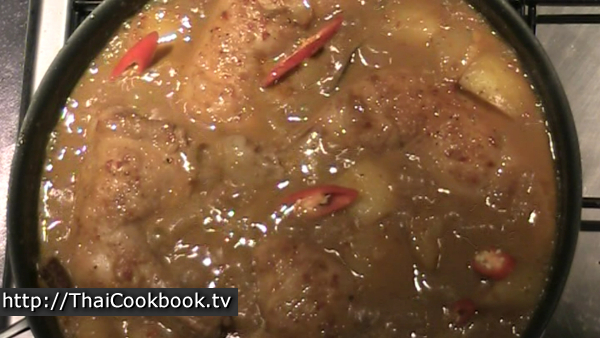 3) Cook the curry paste in half the coconut milk until bubbly, then add the other half and stir it in well. 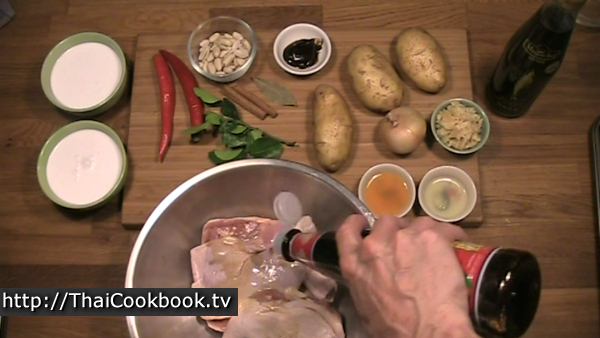 Lay the chicken, onion, potato, peanuts, cinnamon, and bay leaf in the curry. 4) Top the pan with water, cover, and cook for about 30 - 45 minutes or until the potatoes are softened and the chicken is cooked. 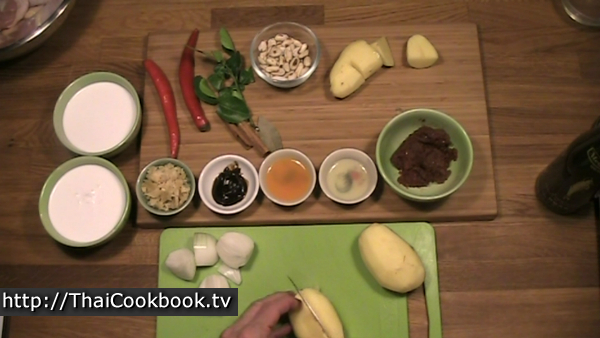 5) Season the curry to your taste with sugar, orange juice, lime juice, tamarind paste, and fish sauce. 6) Add the red peppers, turn off the heat, and allow to cool 15 minutes before serving. 7) Serve with steamed rice. 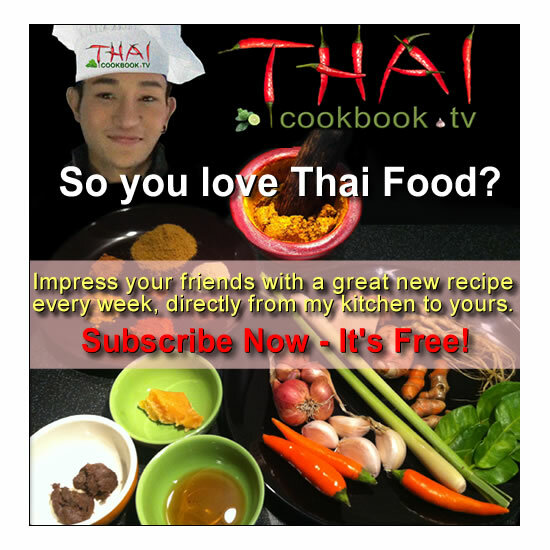 If you have been watching my recent videos, you might remember that I prepared some homemade massaman curry a while ago and put some in my freezer to keep it fresh. Now I've soaked this little plastic bag of frozen curry paste in water for a few minutes, and it's just as good as the day I made it. When I use whole pieces of chicken to make a curry stew, I like to brown it in a broiler for a few minutes first. It adds flavor and color to the chicken. If you don't have a broiler you can ski[p this step and just add the raw chicken to the pan when it's time. Anyway, add about 2 teaspoons of light soy sauce to the chicken, bub it on well, and let it marinate for about 15 minutes. Preheat your oven now to at least 450° F or about 240°C. I use a very hot oven so it browns really fast. 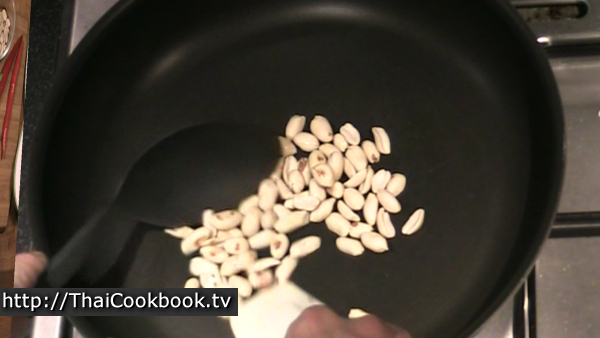 Meanwhile, toast the raw peanuts in a flat pan over low heat until they are lightly browned and aromatic. Set them aside for later. Peel the onion and potatoes. Cut the onion into quarters, the potatoes into large chunky pieces. After 15 minutes in the soy sauce, and allowing time for your oven to get really hot, lay the chicken legs skin side up on a baking sheet with a wire rack. Place them in the broiler, keep a close watch on them so they don't burn. You can brush them with more soy sauce as they cook, if you want. After about 5 - 10 minutes they are sizzling and lightly browned. They are not cooked through. We do that in the curry sauce. Heat 1 cup of the coconut milk in a large frying pan or pot, with a lid. 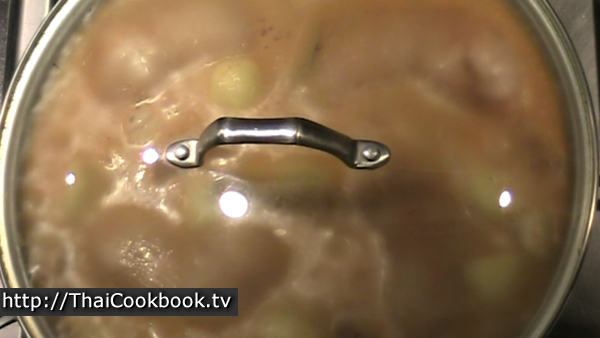 Keep the heat low and cook it until it starts to sizzle and bubble. Add the curry paste to the coconut and let it melt together. Keep stirring. 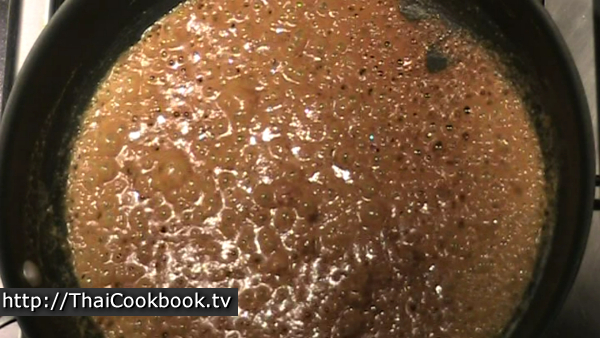 Cook for about 5 minutes, stirring continuously, until most of the water cooks away and you have an oily, sticky paste. Add the second cup of coconut milk now, and stir it in until very smooth. Lay the chicken legs in the pan, skin side up. Spread the potatoes, onion, peanuts, cinnamon sticks and bay leaf around, then add enough water to come to the top of the chicken and other ingredients. Cover the pan and cook slowly for about 30 minutes. Plain curry paste with coconut milk is very bland. 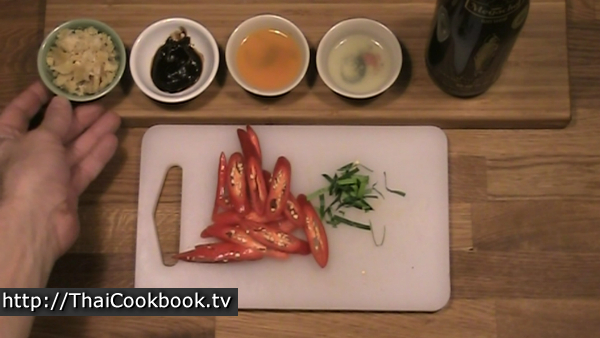 We'll make the flavor come alive when we add sugar, tamarind paste, orange juice, lime juice, and fish sauce as needed. Cut the red peppers diagonally so they look pretty, and slice the kaffir lime leaves into thin strips. After cooking for a while, the potatoes will be softened and cut easily with a fork. Taste your curry now, and you'll probably think that it's awful. Mostly it needs sugar to make the nutmeg and cinnamon flavors come out. Now stir in the orange and lime juice. Add half the tamarind to start. Tamarind paste can be either quite bland or very sour. We want sour, but not too much, so we'll taste it before adding more. Next add the coconut sugar, stir it in lightly, and bring the pan back to a nice bubble. Now taste the curry again, and you should notice a big improvement. Some packaged curries are very salty, so you may not want to add the fish salt. I use just a little salt in my homemade curry pastes so I can control in all when I cook. I'll add just one teaspoon of fish sauce now. 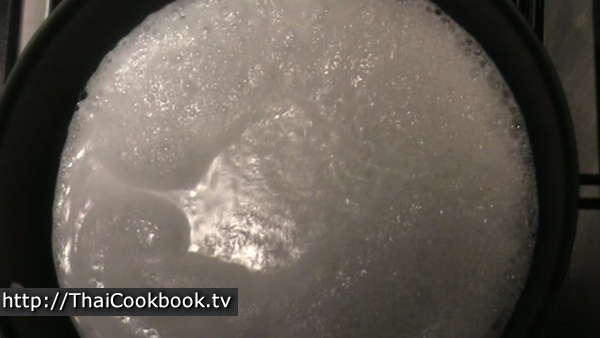 Stir it up well, let it bubble for a minute, then taste it again. At this time it's up to your own tastes, and whether it needs more sugar, salty flavor, or sour tamarind flavor. It's quite likely that you'll think it's great already if you've added the ingredients from my list correctly. Turn off the heat, spread the red peppers around and stir them in a little. Let the curry sit in the pan for at least 15 minutes before serving so it has time to thicken and soak up some of the sauce back into the chicken. I'll plate this for a one-dish meal with some hot rice, but you could just put it all on a platter to be served at the table with other foods. Add one chicken leg, some potatoes and onion pieces, and plenty of the curry sauce all around. 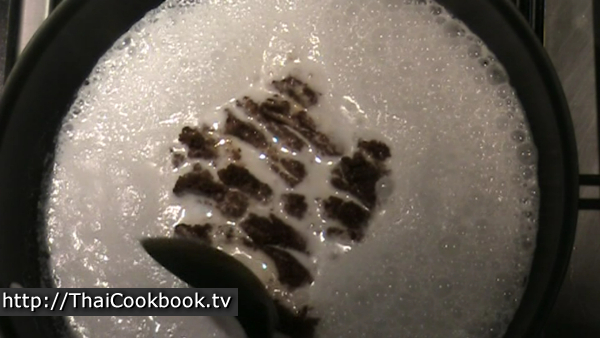 Lay a few pieces of kaffir lime leaf here and there, then dust very lightly with ground nutmeg over the whole plate. And now all you do is add a fork and spoon to eat it Thailand-style. Enjoy!